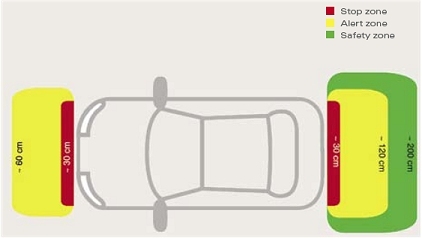 ParkMaster parking sensors measure the distance between the obstacle and your vehicle and alerts you through an audible signal, enabling you to avoid collisions, protect people and make driving and parking easy. ParkMaster uses ultrasonic sensors strategically fitted to the front and rear bumpers enabling the detection of obstacles below 60 cm to the front and below 2 meters to the rear of the vehicle. An audible warning signal, increasing in frequency, is transmitted to the driver the closer he gets to the obstacle. Under 30 cm, the beeping is constant, it is time to stop! • The system is active both when the vehicle is stationary or on the move. • Can be installed on all types of vehicles including: motorhomes, passenger cars and commercial vehicles. • Compatible with towing balls and spare wheels. Park with confidence. Furthermore, the system not only complies with the ISO 9001 standard but also with ISO 17386 for 2004, which is specific to low speed manoeuvres.